A while back, a reader asked me whether or not “suitcase nukes” actually existed. I expressed my skepticism, but deferred to a more knowledgeble colleague. I also recommend Carey Sublette’s excellent essay, Alexander Lebed and Suitcase Nukes. It is quite important to differentiate between the possibility of suitcase-sized bombs and whether terrorists possess actual diverted inventory of a possible Russian design. 1) The AP story was chock-a-block (… I always wanted to use that word!…) with technical error. It is scary if Majidi, who is responsible for protecting us from this stuff, could state such nonsense and have his numbers so screwy. 2) Sublette’s essay was on the Lebed issue – NOT on the very real existance of very small bombs which can fit in a large suitcase. Within his essay is a link to a discussion of the actual possibilities. These very real artillery shell are the basis for the mockup shown in Jeffery’s post. A “homebuilt” uranium gun is well within the skill level of competent groups. In “The Curve of Binding Energy” Ted Taylor gives rather detailed descriptions of a device which would fit in a golfbag and weigh a couple hundred kilograms yielding 1 kiloton. Just letting people believe in the existence of pre-planted nuclear devices could have some of the desired psychological effects. 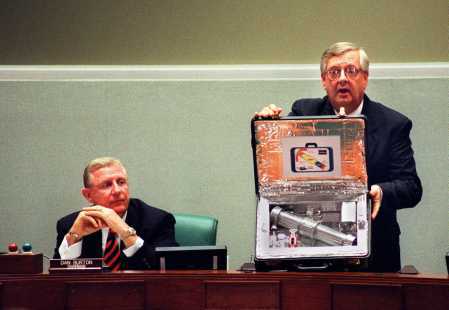 Similar rumors have described a nuclear device hidden in the Soviet embassy — presumably transported by diplomatic pouch. In either case, the extraordinary risks involved make the story quite doubtful. The difficulty of maintaining any such device in working order for very long makes the story downright implausible. Perhaps suit/briefcase nukes are red herrings. Low-yield, relatively small nuclear warheads were used in the atomic Davy Crockett shell, the ‘backpackable’ Special Atomic Demolition Munition (SADM), and its big sister MADM . These were designed, built, and deployed decades ago. Even if they’re no longer available (to be stolen or lost), couldn’t something similar be recreated with today’s technology? As their names suggests these weapons did not have a pure deterrent function but were supposed to be used as tactical weapons to destroy high value military targets (e.g. bridges.) As far as I know they were prepositioned in NATO countries. It seems likely that Russia also had such weapons in its arsenal. Wether such Rusian weapons still exist and if it is likely that terrorists would be able to obtain such bombs is of course a different matter. One can imagine that suitcase nukes or prepositioned nukes would be useful for zero-warning decapitation in a surprise attack, or as a deterrent in some scenarios, e.g. that their existence could be revealed in case of a very severe crisis, if one feared a first strike from the other side (you could tell them where one was hidden, and that there were others). However, the possibility of one of the bombs being detected in peacetime, or that one might pass out of your control due to a defection, sale to a terrorist, or mental breakdown of an agent responsible for one or more of the weapons, would seem likely a compelling argument against deployment of such weapons except possibly, again, in anticipation of a possible crisis situation in which such weapons would be useful. My conclusion would be that it is possible for weapons to have been made for this purpose, but unlikely that they would ever have been deployed, e.g. prepositioned, or even released from a secure facility. I understood it to be a former president who offhandedly described the nuclear weapon on the second floor of the Soviet embassy in DC, but then I heard this a few years back and the details escape me – however I must be asking in the right place? Correct me if I’m wrong but isn’t plutonium oxidation a serious issue with smaller weapons? If these (alleged) weapons were manufactured in the 1970s and have been (potentially) out of maintenance for a decade and a half would they even be serviceable? Not saying you couldn’t re-use the components in some other home-brewed device but without a depot overhaul could they be used as is at this stage? It makes no difference at the moment. If the Russian did at one time have so-called suitcase nukes they don’t now. Besides Curt Weldon goes to sleep at night worrying about the one under his bed. If UBL had one we would also know it by the big hole in the ground where NYC or any city for that matter once was…. We better start worrying about the 410MT of HEU that is poorly secured in the Federation before we have any big holes where a city once was. That is the threat! Besides us mis-placing a few W80-1 by accident…. The Memory Hole, that was it – cheers. At least no-one has recently suggested that the mythical lightweight Californium suitcase nuke (lower critical mass) has ever been made! The background is that the UK plutonium in Barter B under the 1958 US-UK Mutual Defence Agreement came from both military and civil magnox reactors. The US undertook not to use the civil plutonium for weapons – explaining this the UK MoD says: “Civilian programmes include californium production and reactor research.”, so californium production is the first mentioned use of this civil plutonium. The UK MoD does not say how much of this 4.1 tonnes barter came from civilian reactors, but as UK military reactors produced I think roughly 500kg/year, in the 5 years full production of the UK military reactors would be less than the 4.1 tonnes. Also the other 2 barters which came entirely from military reactors were for only 0.5+0.8 tonnes. So probably the majority of the 4.1 tonnes came from civil reactors. 2+ tonnes of plutonium is a lot to use for “programmes [that] include californium production and reactor research.” If californium production was a minor use, why explicitly mention it? Can anyone offer an easy explanation? I think he’s more worried about whether there’s an FBI agent under his bed and his daughter’s bed. But to go off at a tangent, hopefully without creating urban-myth fodder, can anyone explain why the UK Ministry of Defence offers “californium production” as a significant use for a substantial part of 4.2 tonnes of plutonium that the UK supplied to the US between 1964-1969? I always thought only gram quantities of Californium had ever been isolated, so I’ve always been puzzled by this MoD statement – though I have no understanding of Californium production; maybe it is easy to explain. Indeed it is. High atomic mass transuranics are created by multiple neutron captures, starting (ultimately) with U-238. To make Cf-252 this requires 14 successive captures. The problem is: at each stage of this 14-step process the production rate is a fraction of the production rate of the previous product in the chain of captures. When you multiply the starting product production rate by a fraction fourteen times you end up with a very small number. To get significant amounts of product 14 you need very large amounts of starting material. To make grams of Cf-252 you need tons of starting material, plus years of irradiation in a high flux reactor. The fuel grade plutonium makes a good starting material because it contains a relatively high concentration of Pu-242, which is already four steps along the production chain. Carey, thanks muchly for that Cf-252 production explanation. As this Pu was from a military exchange, I had wondered if the Pu was for producing enough Cf-251 for military research, eg measuring Cf-251 critical mass. Sounds very unlikely. Incidentally, there is a published estimate of theoretical Cf critical masses in Evaluation of nuclear criticality safety data and limits for actinides in transport – C4/TMR2001/200-1 eg 5.46kg for bare sphere Cf-251.